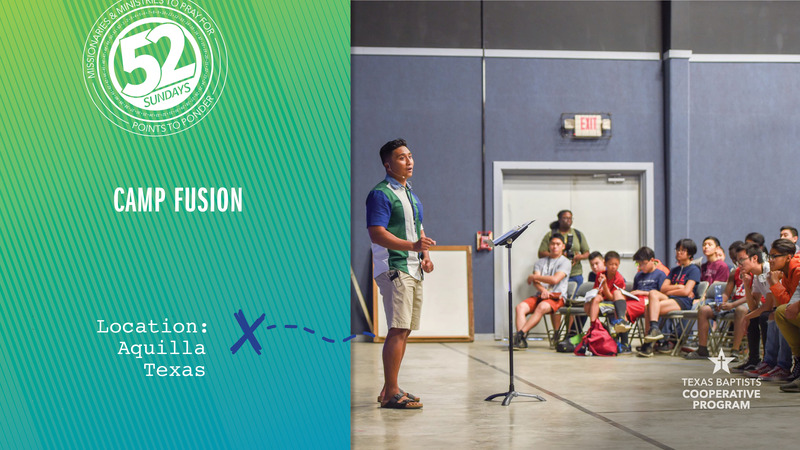 Each summer, for five days and four nights, students from Texas Baptists Intercultural Churches unite together for a week of Camp Fusion. Last year, 291 students representing 18 churches attended Camp Fusion. Of those students, at least eight nationalities were represented: Vietnamese, Cambodian, Lao, Filipino, Chinese, Congolese, Nigerian and Haitian. These students were placed into multicultural small groups throughout the week to form cross-cultural relationships. According to Camp Director Mark Heavener, Camp Fusion aims to connect students from Texas Baptists Intercultural Churches at a crucial time in their faith journey. During this camp experience they worship, fellowship, grow intellectually through teaching, physically through recreation and spiritually through God’s word. At the end of the 2018 camp, 12 students made first-time professions of faith, 70 students made recommitments of faith, 27 students were called to cross-cultural missions, with 43 students called into ministry and 118 students making a personal commitment to spiritually grow throughout the upcoming year. Camp Fusion is the training ground for the next generation of leaders in Intercultural Churches. This ministry has become a phenomenon among intercultural students and is made possible by generous gifts from churches such as ours through the Cooperative Program. Today, let’s pray for the staff, leaders, and students who attend Camp Fusion.